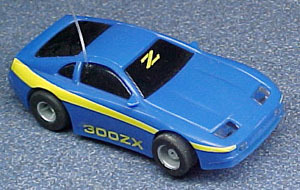 This is a set only Tyco TCR Nissan 300-ZX. It is new never used and comes on a standard Tyco TCR chassis. The light assembly in front has been cut out to allow for the chassis to fit properly. This was by design and is original.